As trailers have been towed out of UC Santa Cruz’s trailer park, it has left empty gaps in an anxious community. One student thumbed through a binder of camper park history pointing to a list of over 100 names. The student, who wished to remain anonymous, sat slightly slouched, close to Annarose Leff and Karolina Wirga, two friends and members of the camper park. They sat in the middle of the street extending through the park, reflecting on their memories when they first moved into their trailers. Built to address a housing shortage, the UCSC camper park has been around since 1984. The community has held weekly potlucks since its creation, promoted shared garden spaces and served as a space for students to maintain their own unique homes. In early June, UC Santa Cruz College’s Housing and Educational Services (CHES) announced plans to replace all 42 student-owned trailers with university trailers and to install a $1.8 million sewer line through the trailer park grounds. Many of the trailers occupying the park were run-down and didn’t adhere to safety regulations, said CHES director and Assistant Vice Chancellor Sue Matthews. UCSC offered a $2,500 settlement compensation per trailer and offered to tow the trailers off of campus. But despite the sudden announcement and payout, the park community has other plans. The park began a petition to “save the camper park,” which has since garnered over 1,000 signatures asking that the trailer park remain student-owned. The community — including current residents, other UCSC students and alumni — proposed an alternative idea, the Tiny Homes project. They pitched the project to UCSC in the hopes that CHES would find both its cost and capacity to accommodate more students much more attractive than the original plan set to take place in fall. The Tiny Homes idea, based on the UC Davis Domes project, is aimed at installing 42 tiny homes, each at around 500 square feet and capable of housing one or two students. The homes cost about $5,000 to $10,000 each, compared to the new trailers the university plans to install, which cost just under $20,000. The park community proposed that UCSC lease the land via a third party nonprofit, which would maintain student access and ownership of the land. “The financial differences between our proposal and their proposal were attractive to them, though they were nervous about the timeline of it and letting it get out of their control,” said camper park resident Annarose Leff. With the incoming 650 additional students to be enrolled at UCSC over the next three years, the residents say that housing more students in the trailer park via the Tiny Homes project would be beneficial for the university. Although Sue Matthews said the proposal is “attractive,” UCSC will continue the original plan to replace all of the trailers by late fall and to install the sewer line. The students said that they are confused why the university will spend upwards of $800,000 only to have the trailers potentially replaced by Tiny Homes in the future. 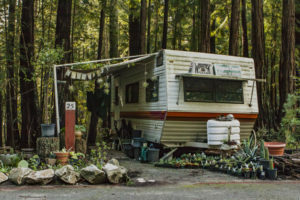 UCSC plans to have the trailer park adhere to the same housing standards as the other campus residences, including maintenance closure during winter and summer breaks. The trailer parks are open year-round so low income students did not have to find alternative housing. The student expressed that because they are a low-income community they cannot afford to leave over breaks and would have nowhere to go if UCSC expanded its housing policies to the camper park. Sue Matthews said there will be more access to the camper park for the entire UCSC community to allow more access for students. There is no intention to change the cost of renting a trailer. For temporary housing during the breaks, Matthews said that in the past there were options for students to stay in a winter hostel while the residential spaces were closed. Matthews says that these logistics are still in negotiation and nothing has been set just yet, though they don’t think that having large groups of first-years would make sense for the camper park. CHES hopes to have the trailers vary in appearance to avoid uniformity and institutionalization. In order to build Tiny Homes, Housing Services and Facilities Director David Keller said that the infrastructure would have to be updated to accommodate the homes utilities. Though the university has a definitive plan to have five trailers moved in by the start of fall quarter, the preliminary groundwork, which needs to be done for the sewer system, will cause disturbances for those in residences. Despite the residents Tiny Homes proposal, Keller said that by the end of fall quarter every empty space will be filled with a new university trailer to accommodate the increasing demand of the park — which has a waitlist of about 50 students.